Is it the number of kids here who keep me so busy or is it the farming? Either way, I have been occupied wrapping up the school year, ordering books for summer and fall, and everything else that happens when you have a large family and some farm animals too. Lucy, the family cow, is officially on a milking break as we are drying her up. She is due to calve August 1st and although a 60 day rest would have been sufficient, I opted to go with a 70 day rest. She's just a tad bit on the thin side plus she's an older cow. I decided that a longer break was warranted, and although her udders look gigantic she seems to be feeling okay. We bought supplies to put up a horse fence for Jonesy so that we can move him from the milking paddock this summer. We are waiting for the pasture hay to be cut and then post holes can be dug. I am sure he is ready to move to a private paddock too because the chickens and goats gather all around when he is fed, pecking and licking at every grain he drops from his mouth. He's a messy eater. The other new project happening is that our meat chicks arrived. Never in a million years would I have ever thought I would raise birds for the freezer but I have decided that commercial chicken is no longer acceptable. Some one has to raise and process poultry locally so it might as well be us! It will be another adventure to follow, right? We purchased Cornish Roasters, not the huge Cornish Crosses that grow extra large, although these roasters should get quite big. There are Red Rangers out there that forage better but they do not have as much white meat and well....that's my favorite part of chicken. We are also using the Joel Salatin model of pasture raised poultry. If you are local you can buy directly from the farm here, just drop me a line. Right now the chicks are in a brooder box with a heat lamp. When I get them moved outside I will update with details on how we are housing them, etc. In the meantime I spend as little time as possible with them so that I can keep that distance. I don't want to make them pets. Gotta love the South too for it's early spring! My garden has all sorts of things blooming and I spied a tomato and zuchinni already! Perhaps it would be wise to clean the pantry tomorrow and get my canning items organized! This weekend is the official kick off of summer around here and we will celebrate with lots of family and food and perhaps even a movie outside. We bought new speakers and want to try them out! Monday promises to be full of pictures because my IT techs will be home to help me figure out why I can't get them downloaded. Translation: Journee and Quinn will be home to help me because I am not computer savvy. 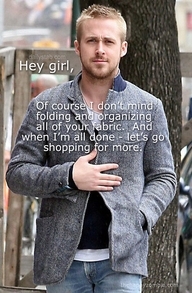 Until then, I leave a "Hey girl, Ryan Gosling" photo for all of you fabric freaks (like me) to enjoy! What plans have you made for the weekend?